A big racing fan in his youth Michael Blash was only 17 when he started working as a mechanic with the RRC Walking Racing Team. The team was running private Brabhams for Jo Siffert and Jo Bonnier. In 1968 - at the age of 20 - he joined Team Lotus and became Graham Hill's mechanic. The following year he looked after Jochen Rindt. It was during this period that he got to know Rindt's manager Bernie Ecclestone. After Rindt's death in 1970 Herbie took on more of a management role at Lotus until he led a walk-out of Lotus staff in 1971 and fell out with team boss Colin Chapman.Blash was then briefly employed by Frank Williams's disastrous Politoys team but when Ecclestone bought Brabham at the end of 1971 he hired Herbie to run his F2 program. 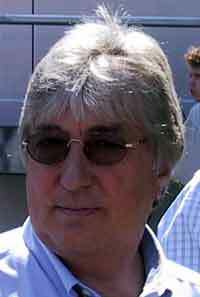 By 1973 Blash was the Brabham F1 team manager, working with Ecclestone and designer Gordon Murray for the next 15 years, during which time Brabham scored 22 victories and Nelson Piquet won the 1981 and 1983 Drivers' World Championships.The alliance began to break up in the mid 1980s as Ecclestone became increasingly involved in FOCA business and Murray left the team after the disastrous BT55 "skateboard" design of 1986, which had seen the death of Elio de Angelis. At the end of 1987 engine suplier BMW pulled out of F1, and Ecclestone decided the team should have a sabbatical and build a high-performance Procar for Alfa Romeo. The team was then sold to Swiss financier Joachim Luhti and Blash left to run Ecclestone's FOCA Television company for a season.Luhti was later arrested and the Middlebridge Group bought the team, Blash returning as Sporting Director. He helped the team rebuild in 1989 and 1990 and played an important role in securing the Brabham-Yamaha alliance for 1991. At the end of that year, however, the famous factory at Chessington was closed and the Brabham team moved to Milton Keynes. Blash was offered a job with Yamaha and joined the Japanese company as its sporting director, overseeing its alliance with Jordan and later Tyrrell. At the same time he was running Yamaha subsidiary Activa - which was housed in the old Brabham factory in Chessington. He continues to run Activa - which does research and development and fabrication work for the motor racing industry. Since December 1995 he has also acted as the FIA's Deputy Race Director at all Grands Prix.